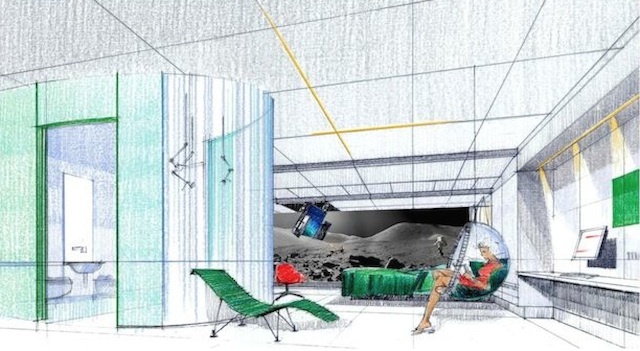 Forget trying to score tickets for the Coachella music fest, and start saving your money to visit a moon-themed resort planned for the desert valley. Dust off your moon boots because a Canadian developer is aiming to build a $4 billion, five-star lunar resort, known as Moon USA, in the city of Coachella, just down the road from where the music fest is held in Indio. That kind of awesomeness is obviously what has been missing from all of our lives. Proposed plans for the sprawling, 10-acre project include the usual resort fare like a huge hotel, large event space and convention halls, restaurants, a health club and beach club. But it would also feature a science and technology campus, as well as, oh, let&apos;s see, a lunar surface with a "fully functional and totally realistic lunar colony set within the world&apos;s largest and tallest sphere" (750 feet), according to a release from the developer, Moon World Resorts, Inc. The developer hopes to open Moon USA in 2022, following a 24-month permitting process and 48 months of construction. That is, of course, if they can get the necessary approvals and actually get the wild, costly and gargantuan concept off the landing pad. The lunatics developers have also tried unsuccessfully to bring Moon USA to Las Vegas for years, so we&apos;ll see how this effort works out. It seems that Mark Weber, economic development manager for the City of Coachella, is pretty jazzed about Moon USA. "We are thrilled Moon World Resorts chose the City of Coachella as the location for this truly amazing and highly imaginative project," he says in the release. "We look forward to assisting as the team proceeds through the various planning, approval and development stages." Considering that Coachella calls itself "City of Eternal Sunshine - Gateway to the Salton Sea," we just wonder if a massive moon might eclipse all of that sunshine.